Users of Korean mobile messaging app Kakao Talk can finally chat with their friends across devices now – from their smartphones to the desktop. We earlier reported that the PC version of Kakao Talk was set to launch in June, and the company announced its availability in Korea today via a prior reservation system, following a beta test for the PC version launched in March. International users will get the service on 26 June. 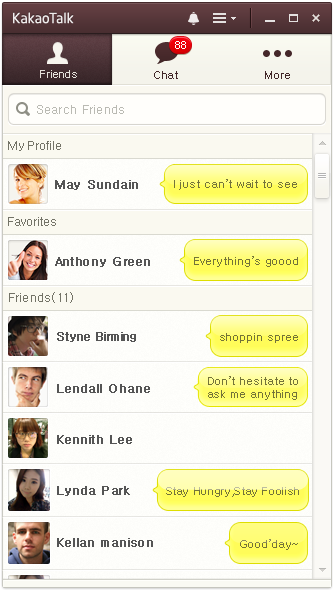 The PC version of Kakao Talk is a stripped down version of the mobile client. The company says it features only core chat features such as the friends’ list, chat windows, and the ‘viewed’ tags. The user interface of the PC version, however, is a “near-replica” of the mobile version, Kakao says. Kakao Talk PC has features that received the most requests from beta-test users, the company says. This includes chat window transparency setting, sound settings for alerts, profile editing and attaching computer screenshots directly into the chatroom. The PC version also supports synchronized naming between mobile and the desktop, which allows users to see the names of their friends on the PC version as they do on their mobile. It also supports photo transfers of up to 10 images at a time with a maximum size of 9 megabytes per picture. According to a Kakao spokeswoman earlier, the desktop version is currently only available on Window PCs. There was no mention of a Mac launch in its latest announcement. This isn’t surprising given Windows’ dominance in the South Korean PC market due to partnerships with conglomerates such as Samsung, but a Mac version will likely be in the pipeline. The program can be downloaded from Kakao’s homepage but before you can use Kakao Talk PC, you need to create and verify an account. You can create an account in the ‘More’>’Kakao Account’ menu in the mobile version, and send a verification code to the email you registered your account under. Following that, every time you log on to Kakao Talk PC, an alert indicating “Logged in to PC version” will be sent automatically to the mobile app. Users can verify as many as five devices with one Kakao Talk account, but can only log on to one computer at a time. Next up for Kakao Talk PC will be to support additional features such as file transfer and font options within this year, the company says. Asian mobile-only social services have been reaching critical mass and making progress in monetization, and the obvious next step would be to make their services available on PCs. Kakao has surpassed 90 million users worldwide, Line has over 150 million and WeChat boasts over 300 million.